I'm lucky that 2014 has been a mostly positive year. I could definitely have done more, though I think that every year. I haven't planned much in 2015 yet. When it comes to cons I'll be going to FantasyCon in October. I expect I'll go to Edge Lit too, and possibly part of Nine Worlds in August (seriously everyone who goes to that con raves about it) depending on work. I feel like I should go to cons a bit more (which would help with my first resolution below), but I'll have to see. I also think I should go to more stuff happening on campus, there's always plenty going on and I might as well take advantage of that. Friends - Spend more time with friends by inviting people over more, and hopefully seeing friends from out of town more. I've been asked to restart the board game nights we hosted early in 2014, so that'll be a start. Swimming - I'll aim to go swimming at least once a week, it's the only exercise I get. I've been trying to do that since I started working at the university (which has a pool on campus), but I've been a bit hit and miss. Teeth - I have a lot of cavities, and I need to spend more time and care looking after my teeth. It's that or reduce snacking, and while I will look into eating better I can't reduce the frequency of snacking because I wouldn't be able to function. I only do the minimum when it comes to beauty, but though it's often presented as an appearance thing, really looking after your teeth is a health issue, so I need to adjust my thinking there. Mindfulness - I think that's the right word. There are times when I have difficulty focusing on things, when unwanted thoughts seem to flood my mind and get in the way. I want to get better at shutting them out and being able to focus on the present. It's probably a sign of what I need to improve that most of my resolutions involve building a routine and managing my time better. I know various friends have had a difficult time in 2014, I really hope 2015 sees things improve for you guys. Oops, dropped the ball on blogging a bit. I'm sure you can understand that December can be a distracting month. Plus they've offered overtime at my work to try and catch up with this year's record breaking amount of applications, so I've been doing some of that as December can also be expensive. I feel as though I'm in a good place in general, with work, with family and with writing at the moment. As ever there is stuff I could improve, mostly seeing friends more. With January coming I am resolved to get out and see people more and do better with the blogging by building up my posts again (I was doing so well earlier this year). But more on resolutions closer to New Years. Good wishes to you, whether or not this is a time when you are celebrating. 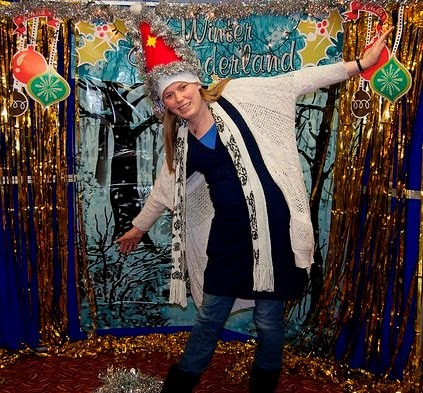 This is me at a recent work Christmas party, wearing a ridiculous Christmas hat of my own design. That hat won me a prize for Most Festive Outfit (there was a separate category for festive jumpers, of which there were many). I'm standing like that because the hat did not entirely fit in the picture otherwise. The expression is just how I tend to look in photos. I'm sure I look more normal the rest of the time, but for obvious reasons there's no photographic evidence of that. The Enterprise is hosting unspecified negotiations with a mysterious species we never see, but who sit in pools of slime. The negotiations will be held by Ambassador Sarek (Spock's dad), who is the only person in the entire Federation these aliens know. Picard and Riker are geeking out about their eminent visitor. His staff arrive first and tell them he's really old and tired and should be kept away from people and events. 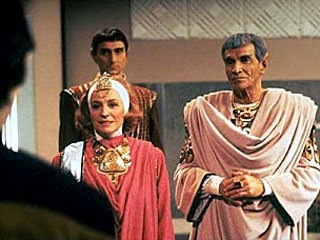 When Sarek arrives with his wife he doesn't seem as feeble as suggested. The crew start being randomly angry, argumentative and violent. At a concert the Ambassador sheds a single tear, and because he's a Vulcan that's super weird. Crusher slaps Wesley for no reason, then tells Troi about it. 10 Forward breaks into a massive bar fight. Troi reports that this has been increasing ever since Sarek came on board. She reckons something telepathic has been happening between Sarek and his Vulcan aide. Crusher says they think the Ambassador has a rare Vulcan form of dementia, but there's no cure and loads of stigma about it. Picard tries to approach Sarek's staff and his wife about his illness, they all deny it. 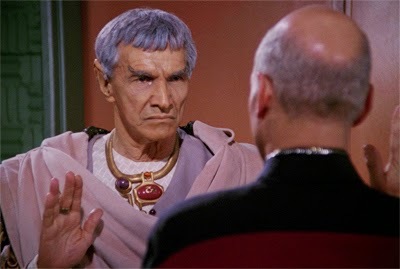 Then he confronts Sarek himself, who dismisses it at first, but Picard goads him to rage quickly. In the circumstances the negotiations should be postponed, but they can't because all mysterious alien races are super unreasonable -so goodness knows why the Federation tries so hard to talk with them. Picard offers himself to take on Sarek's emotions, which is very dangerous, but it actually just makes him pull a lot of odd faces and moan. 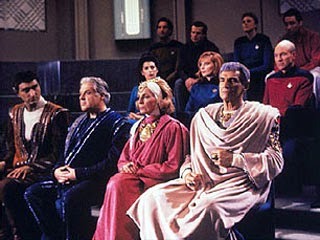 This means Sarek can finish the negotiations that will seal his reputation and allow him retire with dignity. 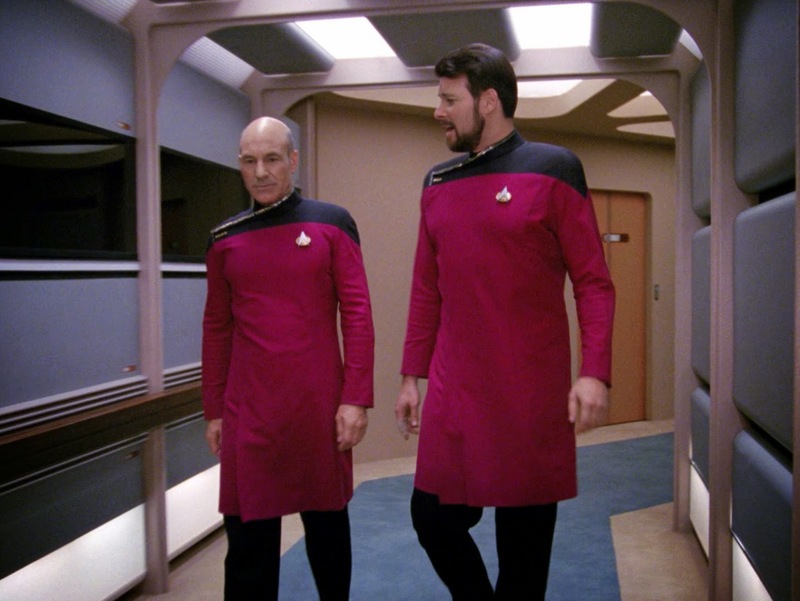 Picard and Riker are totally fanboying about Sarek as they go to the transporter to meet him. They're so excited they have put on their best frocks. Picard actually met him briefly years ago and was totally tongue-tied. Not a mistake he plans to make this time. He's very flattered when Sarek's wife says that her husband has followed his career. Of course he's disappointed when the aides suggest that the Ambassador will be too tired to spend much time with the crew. Picard talks about wanting to talk to Sarek and get to know his thoughts about all the cool stuff he's done and his place in making history (he's practised the conversation in his head, hasn't he?). Given what happens later it is as though a genie heard him and -as is their wont- granted his wish in the most inconvenient way possible. emotional and physical. Patrick Stewart gets to do powerful Shakespearean-level acting of remorse and regret and anger, which means it's very large for something viewed on a TV screen (this kind of acting is designed to fill a theatre). Shouts at: Riker, on the Bridge, over whether to do the awkward thing and confront Sarek about his illness. In an unusual moment of geeking out Riker is as excited as Picard about Sarek's visit. Riker keeps an eye of crew behaviour; commenting on unusually bad reports and insubordination. He stops Geordi and Wesley fighting, acting like a stern but disappointed babysitter. Later he and Worf (who seems unaffected, possibly because he's constantly suppressing Klingon anger) wade into the bar fight and Riker is socked by a medic. Shouts at: Picard, on the Bridge, over whether Picard should do the uncomfortable thing and confront Sarek about his illness. Plays violin at a concert and has settings that allow him to imitate a variety of violinists. While giving a tour of the Bridge the Vulcan aide asks about Troi and Picard and seems to be hinting that Sarek may not be up to his job, possibly he talks to Data because he's all with the logic and such. Later Data approaches the Vulcan aide to ask frankly about the situation. Doesn't shout at anyone, no emotions. Beverly is given something to do! She's not had a whole lot going on this series. I'm still glad she's back, but I kinda still miss her because she's not around much. She's not got her own subplot here or anything like that, but she gets to use her expertise and isn't just there as Wesley's mum (though obviously that happens too). Could be worse, at least she's not being Picard's-old-friend-who-he's-attracted-to-but-doesn't-want-to-ruin-their-friendship-and-it's-complicated. Crusher is mean to Wesley, shouts at and slaps him for no reason. 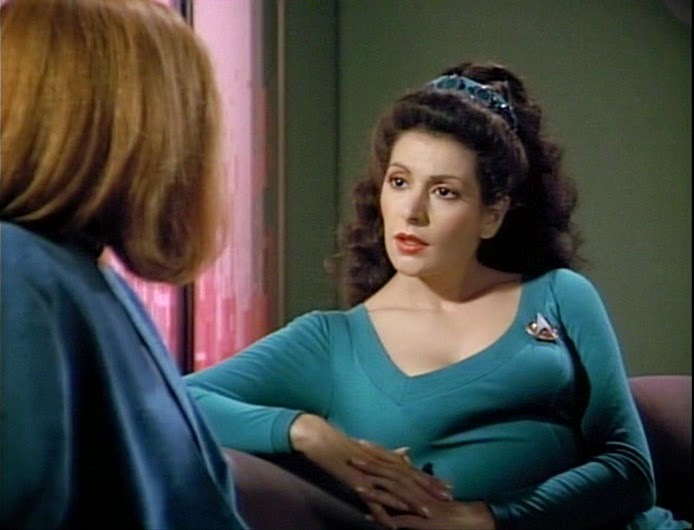 She immediately consults Troi about it, which is sensible, though one hopes she patched things up with Wes too. She and Troi do an off screen investigation into the angry outbursts and their correlation with Sarek's arrival. Why don't we get to see that? Beverly monitors Picard/Sarek during the mind meld and stays with the Captain while he's feeling all of Sarek's pain. At one point he ends up sobbing in her arms, there's little more either of them can do. Geordi and Wesley set up the room for the aliens, including their slime pool. Geordi congratulates Wesley on getting a date with an attractive ensign. As a woman Troi knows that other women have ears and can appreciate music, so she suggests to Picard that maybe if the Ambassador can't attend the concert his wife might like to.Of course Picard uses it as a way to see if she can get the Ambassador to come with her. At the concert Troi notices something about Sarek's emotions and senses what his aide is doing. It's a nice scene showing telepaths/empaths reacting to the unseen. Troi is the one who realises that the anger is related to the Vulcans, especially the Ambassador. 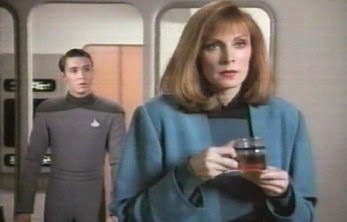 She tells Crusher about it when Beverly consults her about her own episode of uncontrollable rage. Together the women pool their knowledge and investigate Troi's hypothesis until they can present a theory to the Captain. Doesn't shout at anyone, presumably protected by her empathy. The transporter chief and some fellow yellowshirts start a fight over seats with some blueshirts in 10 Forward. It becomes a full on brawl. Where was Guinan? I'd expect to see her knocking some heads and calming the whole thing down. 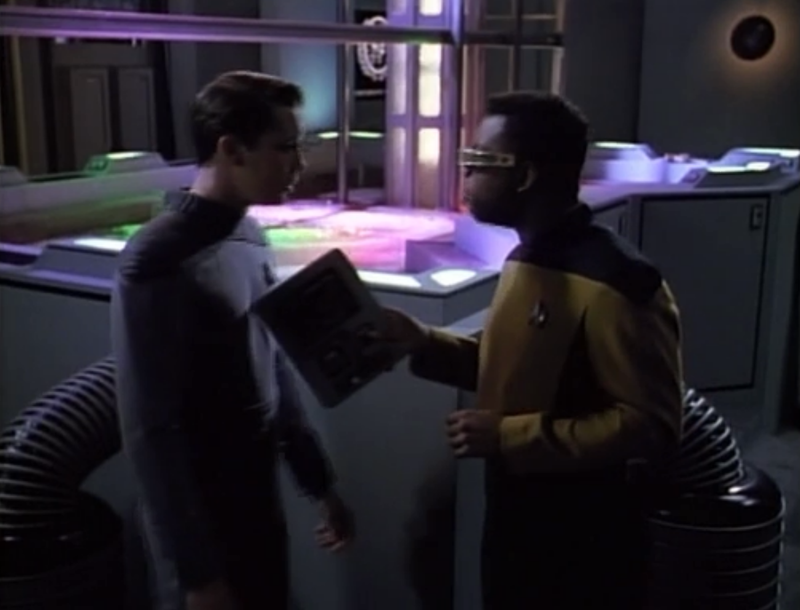 Wesley helps Geordi, because again all the qualified engineers are busy. He has a date with an unseen woman who outranks him (unless Geordi was referring to something else when he said that she was out of Wesley's league). Shouts at: Geordi, in negotiation room, over Geordi's jealousy of his lovelife and Geordi falling for holodeck women (so people know about that huh?). Also shouted at and slapped by his mother for hardly anything. It's Wesley, but that's still harsh. Crusher and Troi talk kinda about Wesley and how she slapped him, but it's more about her anger - could be a Bechdel pass depending on how strict you're being. They investigate the situation together, as is natural given their jobs, but we don't get to see it. There is a distinct lack of the main female characters working together to solve a problem and generally being good at their jobs. And it can't be because it's dull! Look at all the console tapping, infodumping and technobabble from Geordi, Data and Wesley we have to sit through every other week! I rather suspect that as neither woman was being eye candy, having an emotional plotline or doing something healing/caring it was deemed unimportant for screen time. The Ambassador's wife is introduced oddly, like they kinda forgot she was there, so her husband has to point out who is she. When Picard visits her she says she doesn't get her own visitors, but Picard is really just trying to get to her husband through her anyway. The Ambassador's wife does collude with his staff to manage his illness, though it seems bad she didn't talk to him about it. Then again it does sound as though she's experiencing a certain amount of denial, pushing for him to get through this one last job before he can retire. Plus she's likely to be his main caregiver and seeing how violent the crew gets when influenced by Sarek no one could envy her what's coming. 2. Picard talks to the Ambassdor's human aide, who says the negotiations cannot be delayed, and denies Sarek's illness or its consequences. Sarek and party leave. He shares a special goodbye for Picard and they do that Vulcan hand gesture thing. There are a couple of things I'm looking forward to from the BBC. Radio 4 will be broadcasting an adaption of Good Omens by Terry Pratchett and Neil Gaiman each evening during Christmas Week. I've said here before how much I love Good Omens. Obviously I'm pretty excited about this, I've memorised bits of this book through rereading it so much. I'm working two days that week so I might well have to catch up on the first few episodes. Next year there's going to be a TV adaption of Jonathan Strange and Mr Norrell by Susanna Clarke, which I read and enjoyed years ago. I still have my copy, which is a very large hardback, possibly explaining why I haven't reread it. Though I don't do much rereading anymore. There isn't a release date for the TV series yet, and it's supposed to premiere on BBC America, but hopefully it'll be on over here at around the same time. It's period drama, which the BBC does well, but with fantasy too. I'm rather excited that Eddie Marsan is going to be playing Mr Norrell, he's one of those actors who pops up all over the place in TV and film. I've seen him play a variety of roles, including period drama, so I'm sure he'll be good here. The BBC's last few forays into TV sci-fi haven't gone so well (I'm not counting Doctor Who that's kind of a given and not new anymore). Outcasts was interesting but also slow and weird (but not weird in an engaging way). Hyperdrive was terrible, but sci-fi comedy is tricky, even Red Dwarf is pretty hit and miss. I quite liked the Dirk Gently TV series they did, but understand why big fans of Adams and the original books didn't. The last real hit I can think of is Life on Mars/Ashes to Ashes, which were more police shows with vague SF elements. Perhaps fantasy will be a better direction, and a well-made adaption will bring in a preexisting audience. It's not like they can't do this stuff well, look at In The Flesh. I do have one request, and it's not even SF. Can they bring back Up The Women? There was talk of a 6-part 2nd series on BBC2 last year, and then nothing. I liked that, it was funny and clever.